KUALA LUMPUR --- The sessions court presided by judge Puan Nursharidah Awang today completely acquitted and discharged National Feedlot Corporation chairman Datuk Dr Mohamad Salleh Ismail of all criminal charges in view of the decision of the Attorney-General who has decided to drop the charges against Datuk Dr Salleh after considering the facts, evidence and merits of the case, and the recommendation of the Court of Appeal of 28 August 2015 which was brought by way of a representation letter to the AG. The representation letter included evidence to show that there was no misappropriation of the loan nor CBT. It was also revealed that the RM250 million was a commercial loan, not a grant from public funds, and repayments were paid on time. Properties were purchased by an NFCorp subsidiary company as an investment for NFCorp according to the terms and conditions of the loan agreement, and not purchased by Datuk Salleh in his name or for personal or family gain. DPP Tuan Syed Faisal Syed Amir appeared for the prosecution while Tan Sri Dr Muhammad Shafee Abdullah, Al Firdaus Shahrul Naing, Syed Ismat Syed Muhamad and Farhah Mustafa appeared for Datuk Dr Salleh. Nonetheless, it will be used as election campaign, again-again every GE, as long as Najib is the PM and UMNO Presiden. That's not all. 1MDB, Jho Low and Razak Baginda, Altantuya too. Even that Carpet guy and Bank Rakyat's interest free loan would be used. 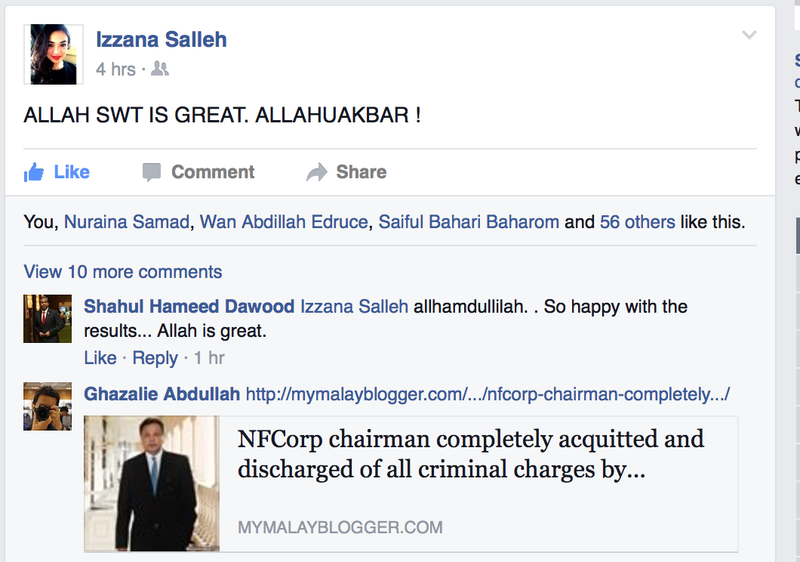 If Najib resign and flip over to Pakatan like that Liwat guy, then everything should be fine. I guess. Faithful servants are heavily rewarded. Alhamdulillah, this case shows it is true. Syukur Alhamdullillah, I had worked under you before and you are OK. Persapsi buruk & fitnah, standard pembangkang kita. 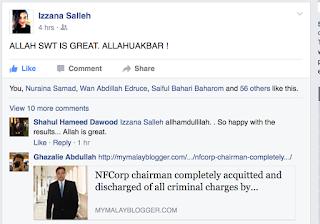 So , it has been an injustice to Dato Salleh all this while . Dato Salleh career and reputation have been destroyed . Now , who is the culprit ? Some former bloke really slept on the job . This same bloke also tried to do the same stunt on 1MDB . At last truth prevail ... thanks to the AlMighty. "....n view of the decision of the Attorney-General who has decided to drop the charges against Datuk Dr Salleh after considering the facts, evidence and merits of the case"
Same guy who ignored Bank Negara's 1MDB case twice? Same guy who freed Ali Tinju because there was no video, and once a video has been handed to police, has done nothing? Same guy who condoned the abuse of s124 and SOSMA? And you think this is for real? The true 'Malaysia Boleh!' spirit. some people just dont understand business that well...so they make stories up...n condem whatever positive news they heard and twist things around.. Referee is given a whistle and it can be used whenever he confronted players who are not adhering to certain rules. Pemfitnah bebal (cam ko) bermaharajalela. Pembangkang kerja dia nak membangkang aja walaupun betul. Percayalah..